Terrorist opens fire towards IDF soldiers at the Tapuach Junction in Samaria. Soldiers return fire and kill him. A terrorist opened fire on Monday night towards Border Police soldiers who were stationed at the Tapuach Junction in Samaria, near the city of Ariel. 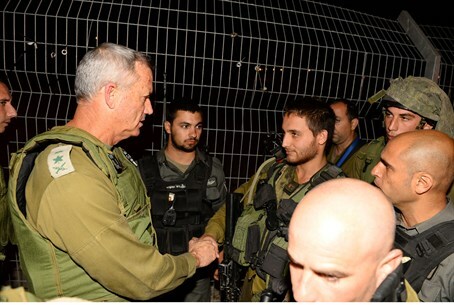 IDF Chief of Staff Benny Gantz, who was nearby, came to the scene of the attack shortly after it occurred. The officers briefed Gantz on the details of the attack. Gershon Mesika, head of the Shomron Regional Council, said on Monday night that the terrorists who carried out the attack were encouraged by the international backing of the Hamas-Fatah unity government. "The terrorists are getting a boost from the recognition by the U.S. and Europe of the terrorist government of Hamas and the Palestinian Authority," said Mesika. "It is time that Israel do what is good for Israel and stop thinking about what the world will say. On this occasion I would like to strengthen the IDF and its soldiers who stand guard day and night and protect the residents of Judea and Samaria and all of Israel," he added. Monday night’s attack comes just three days after security forces apprehended an Arab terrorist wearing a bomb belt at the same location. The terrorist raised suspicions by wearing a large coat in the hot summer weather. After security forces called on him to take off his coat and be checked, the man refused and proceeded to lay on the floor. The foiled suicide bombing was not the first attempted terrorist attack at Tapuach Junction in the past months. In mid-April police officers foiled another stabbing attack. Police noticed an Arab man acting in a suspicious manner. Upon investigation, the officers found a knife in his pocket. A year ago, Evyatar Borovsky, a 31-year-old father of five and actor from Yitzhar, in Samaria, was stabbed to death at the same junction.